If you're already a customer and have recently worked with one of our Home Solutions Specialists, they should have provided you with a Pay it Forward card similar to the one shown here. 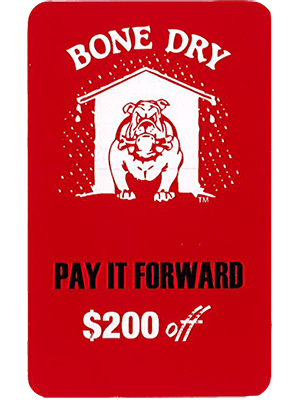 If your experience with Bone Dry Roofing is less recent, but you still have someone you would like us to connect with, please click the link at the bottom of this page to fill out a Pay it Forward form, and we'll get it touch with them pronto! $50 off* any Bone Dry Roofing project valued under $1,000. *Other jobs include gutters, gutter covers, roof cleaning, chimney restoration, liners, masonry, drywall repair/replacement, interior/exterior painting, attic insulation and/or siding. Our business stretching back over 28 years, has always been about taking great care of our customers, doing a great job on their homes and having them share their experience with those close to them. We are always grateful for those endorsements, and want to make sure we say Thanks!, which is where our Bone Dry Roofing Referral Program jumps in! 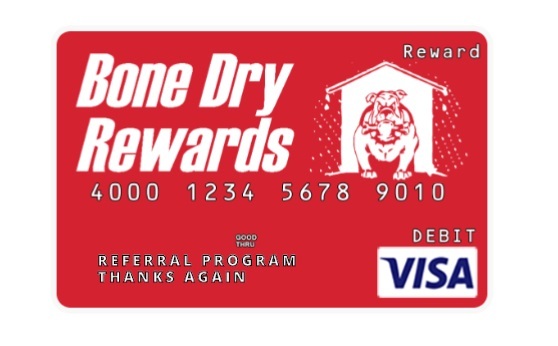 For every Pay it Forward customer that you refer, who chooses to move forward with a Bone Dry Roofing project, we will present you with a Bone Dry Roofing Rewards Visa Card! What happens after you get my form? Once we receive your referral through our online form, we will contact them to schedule a time for their free estimate. If they accept our proposal for the work, once their project is completed, your Bone Dry Roofing Rewards Visa Card will be mailed to you or hand delivered.